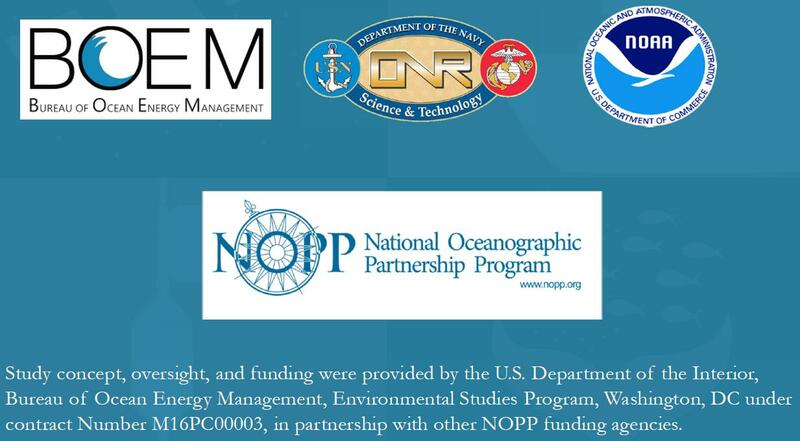 The Atlantic Deepwater Ecosystem Observatory Network for the U.S. Mid- and South Atlantic Outer Continental Shelf (OCS) was developed and deployed in November of 2017. The lead P.I. for this project is Dr. Jennifer Miksis-Olds, University of New Hampshire (UNH). Dr. Miksis-Olds leads a collaborative research team consisting of individuals from UNH, OASIS, TNO, JASCO, Stony Brook University, and NOAA. This observatory network will generate long-term measurements of both the natural and human factors active in this region, thus informing the ecology and soundscape of the OCS. These data will provide further a mechanistic understanding of the cumulative impacts these factors have on marine resources and provide insight for ecosystem-based management efforts. Long-term observations of living marine resources and marine sound will assist Federal agencies, including BOEM, ONR, and NOAA, in complying with mandates in the Endangered Species Act (ESA), Marine Mammal Protection Act (MMPA), and Sustainable Fisheries Act (SFA). Establish an ecosystem observation network that provides baseline monitoring and supports predictive modeling of the soundscape and its relationship to marine life and the environment of the Mid- and South Atlantic Planning Areas. Develop standardized measurement and processing methods and visualization metrics for comparing ADEON observations with data from other monitoring networks. Assess baseline soundscape and ecosystem conditions in support of predictive environmental modeling and trend analyses in the planning areas. How do soundscape and ecosystem components vary with water depth across the OCS? How do the soundscape and ecosystem components vary with latitude along the OCS? Where are the hot spots of human activity for consideration in ecosystem/habitat health impacts? Assess the spatial and temporal distribution of the soundscape and biological scatterers, including their expected variation and correlation with distance from the bottom-lander locations. What are the environmental factors that define and constrain the horizontal range of appropriate extrapolation of observations measured at the stationary bottom-lander sites? Develop and apply new methods for the effective visualization of five-dimensional (5D – time, latitude, longitude, frequency, and depth) soundscape data to interactive visual analysis tools that enable users to explore, analyze, and integrate ancillary ecosystem data streams with the 5D soundscape. Develop a robust data management system that archives and provides public access to multiple data streams to encourage future development of ecological models targeted at questions beyond the scope of this study.